I Love Apple and Mac !! We apologize that maintenance is taking longer than expected. If your program membership was set to expire during this period, it has been extended and your app will remain on the App Store. If you have any other concerns about your account, please contact us. Apple's Developer Center has been down for more than a day now, with no word from Apple on the reason behind the outage. MacRumors first began receiving reports of the downtime on July 18, at approximately 7:30 am PT. 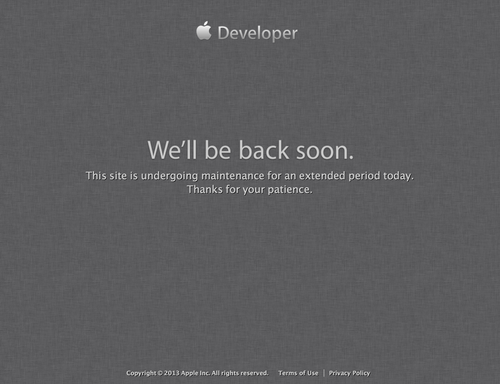 "This site is undergoing maintenance for an extended period today," the iOS and OS X sites read. "Thanks for your patience." 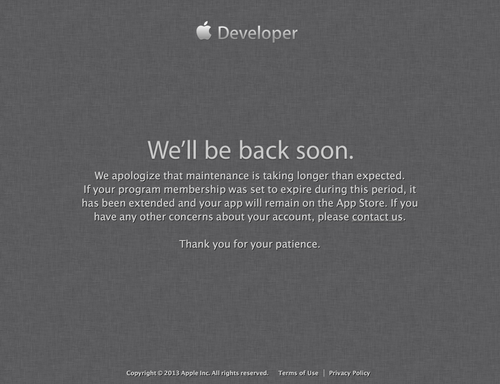 Apple's developer Web site experiences an extended issue for more than 30 hours, and developers are starting to get restless.